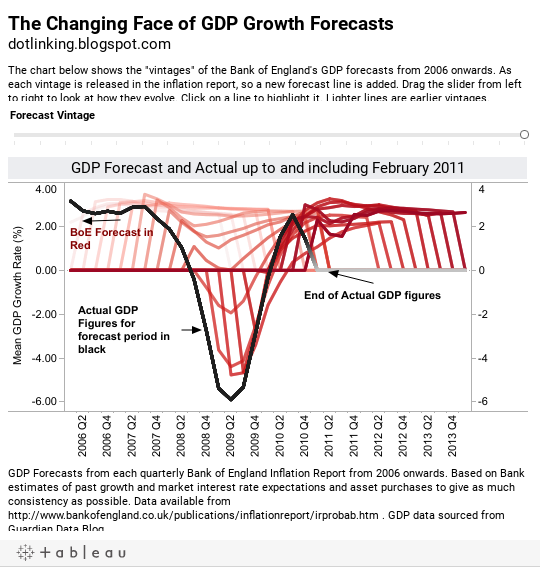 The Guardian posted today on how the Bank of England's GDP forecasts have changed as new vintages have been released through the inflation reports. I found it really difficult to see how the visualisation they chose showed the point that they were trying to make, so here's my attempt at producing something a bit clearer. I would prefer to keep to the same fan chart style and not have to use a set of point estimates, but the data provided don't lend themselves to doing this very easily or nicely.